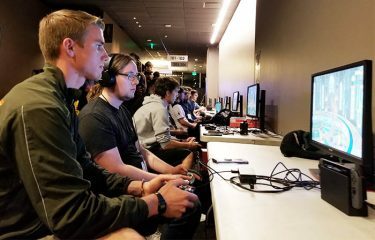 Almost 130 gamers entered the first GCU-supported video game tournament on campus, the Super Smash Showdown. Saturday’s Super Smash Showdown smashed it. Approximately 300 GCU students attended the event at its peak. 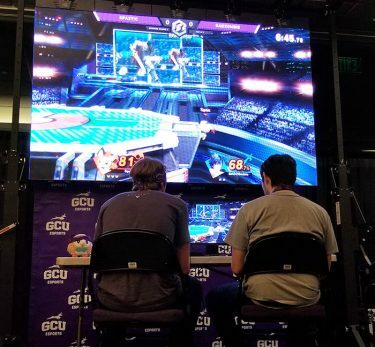 It was the first GCU-supported video game tournament presented on campus by the University’s Esports Program, building on casually organized events by campus Smash Club gamers who would video game together for fun. One-hundred twenty-eight Super Smash Bros. competitors joined in the eight-hour gaming event at GCU Arena. Placing first and winning a $300 GameStop Gift Card was Jonathan “TMJ” Hoffman. Alex “Fortune” Nevarez nabbed second place and a $100 GameStop gift card, and Tanner “McDale” Webdale placed third and won a $50 GameStop gift card. Winners of the tournament: Alex “Fortune” Nevarez, second place; Jonathan “TMJ” Hoffman, first place; and Tanner “McDale” Webdale, third. 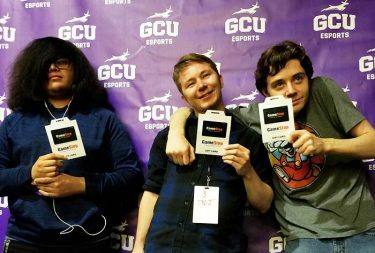 The Super Smash Showdown was broadcast live with commentary on GCU Esports’ Twitch, GCU TV and various other GCU sources. The tournament spanned about eight hours Saturday at GCU Arena. Super Smash Bros. is a series of fighting video games featuring gaming icons, many from the Nintendo world, such as Super Mario Bros, Donkey Long, Kirby and Legend of Zelda, to name a few. The objective is to knock opponents off a stage. To get involved with the GCU Smash community, Lee said, stop by the GCU Esports Arena at 7 p.m. on Fridays on the second floor of the Technology Building, Room 224. “Bring your controllers!” he said. Click on this link to view Saturday’s competition webcast. Great job!!! Congratulations to all of you!! !